It's a love / hate thing for me when in comes to Smog. Half the time I have no idea what grim thing he is singing about and if I do think I have a sense of his literary theme, it is often an uncomfortable one. Uncomfortable for many reasons. Perverse, self loathing, unwieldy weather conditions, venomous words against those seemingly close to him, nature and animal symbolism applied in unsuspecting ways... often all poetically stunning but in back handed way. 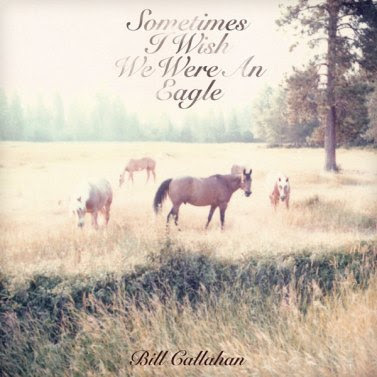 Couple pin prickly words with a cool baritone but mournful vocal, and there you have Mr. Callahan. He creates complex songs that reveal a naked man, for better or for worse, like Adam has slipped away from Eve and with a smirk is about to tell you about the events that have unfolded. In interviews he has explained away many of the more threatening themes of his music by explaining there was an important and good moral buried among his ruined characters and story lines but on a facade level, the guy seems pretty intense in a please don't leave me alone in a room with him for too long kind of way. Like a mirror, Bill is filled with light and dark and beyond the ability to reflect there appears to be a threatening and fantastic otherworldly void within in staring right at you. The thing is, Smog is gone a thing of the past and in his place is the man behind that elusive element gone bad. Up from the filth and fury rises Bill Callahan, a man who sounds not quite at peace with the world but willing to maybe shake its hand and break bread with it. His lyrical choices are drenched in power but it is just as important to call attention to the music, dotted with gentle strings that appear now again like a hummingbird resting for a moment on a chorus, verse, or bridge. The instrumentation is the ultimate cradle to his voice.